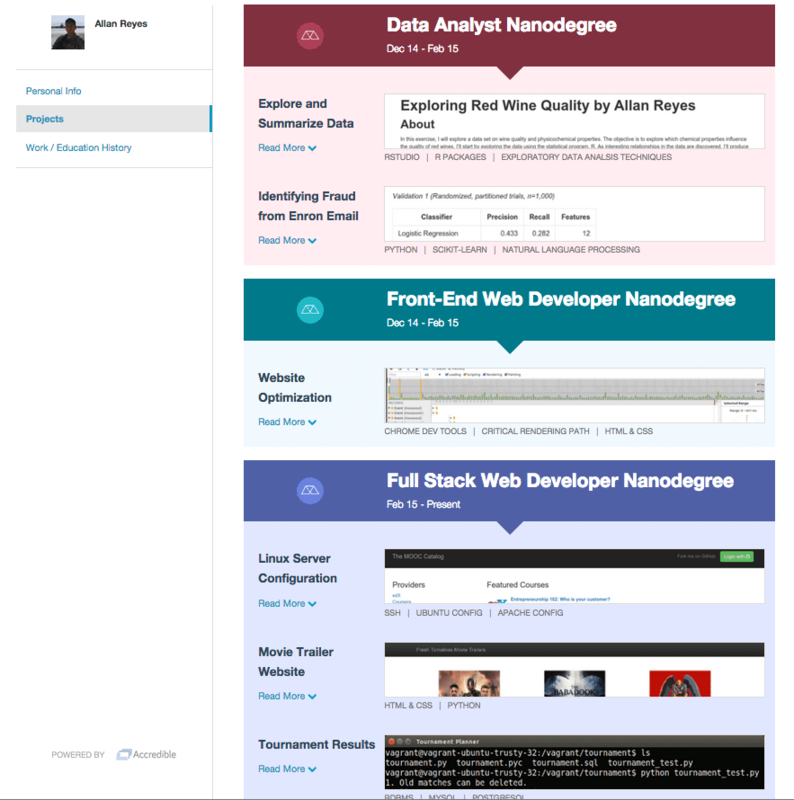 If you’re taking one of our Nanodegree programs, we’re happy to announce that you’ll now be able to take advantage of our new professional profiles, through which you can showcase your skills to potential employers and advertise your employment preferences (as well as share your portfolios with your peers and friends!). If you’re an enrolled student, you can get started right now by going to your profile (also accessible by clicking on your name in the upper right-hand corner and selecting ‘Profile’ in the drop-down menu) and syncing your relevant accounts when prompted. Once all sections have been populated and edited to your satisfaction, be sure to toggle the switch next to the ‘Recruitment Info’ section to “Looking for Jobs” to let others know you’re in the market! When you start a Nanodegree, new sections within your profile are automatically created. They are also automatically populated with portfolio items (for now, just your projects), as you work through the program, leaving you free to focus on learning while a project portfolio is built for you. You can of course improve your profiles by uploading extra examples of your work as you go. You can opt-in to show potential employers not only your Nanodegree projects but also your work history and preferences, including cities and countries to which you are willing to relocate, simply by completing your profile. Employers can then see at a glance what you learned, what you can do and whether their open positions might be relevant for you. The new profiles are powered by Accredible, who are best known for their interactive course digital certificates in order to make students accessible and attractive to recruiters. We’re excited to team up with them on this career effort! If you haven’t yet enrolled in a Nanodegree, why not start today? Nanodegrees are built and recognized by leading technology companies, designed specifically to advance your career. They teach the skills necessary to excel in technology’s most sought-after positions, and enable you to practice and demonstrate those skills through realistic projects. Nanodegrees currently available include: Data Analyst, Front-End Web Developer, Full Stack Web Developer, iOS Developer, Introduction to Programming. ← Contract vs Freelance vs Full-Time: Can You Tell the Difference?